With a couple exceptions here or there, as a rule I don't write or talk too much about my kiddos on here. No particular reason why, except maybe I'm eternally grateful that my mom 'n dad didn't detail all my little kid foibles for all the world to know when I was wee lad. Well, today I'll let you in on a few little verbal treats that my older daughter, M, has laid on me recently. Keep in mind, she's still a couple months away from turning three. When I told her it was time to go brush her teeth: "Maybe you can go brush yo' teef by yo'self and I go hide." When I told her that she was going to wear tights on one particular day despite her protests but could wear pants the next: "Well maybe I will go pee-pee in my tights today so I can wear pants today." One last one, from when I said she would be a good mama one day because of how good care she took of her little sister (Baby B, just a few months old): "No I don't want to be a mama, cuz soon I will turn into a boy and then I will be Daniel Tiger!" 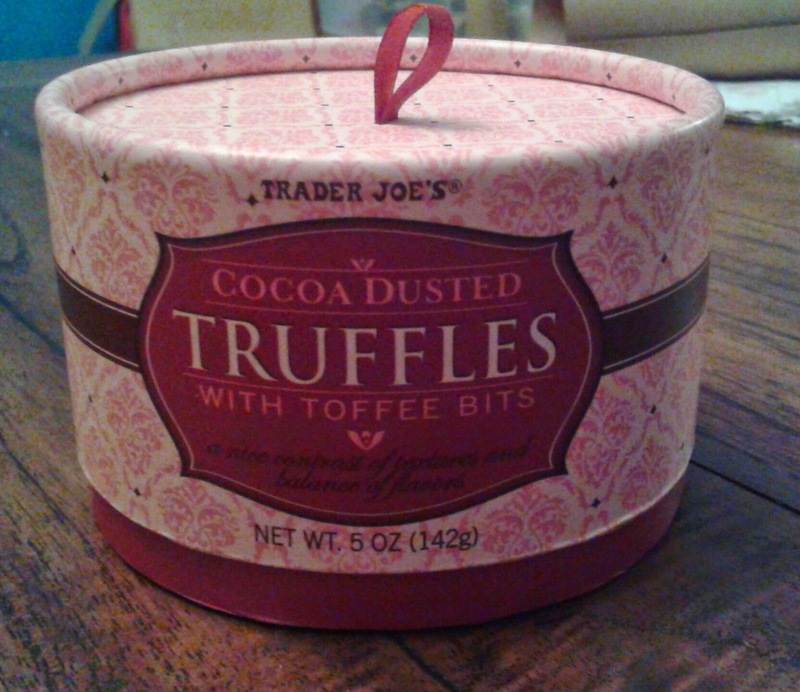 It was her cute toddler persistence that led us to buy these Trader Joe's Cocoa Dusted Truffles with toffee Bits. Every shopping trip we let her pick out a treat. I can only presume the packaging caught her eyes as she exclaimed "Oooooh I want that one! Pwease?" Of course, she can't read yet, so it might have contained sardines for all she knew. We asked her if she knew what it was. "No, but I like it already!" Well, okay, little love. Turns out she knows how to pick them. These truffles were quite the hit over several nights at our house. In all, they're pretty basic: a milk chocolate candy shell with a cocoa coating, with rich choco-filling with a little hint of toffee here and there. I apologize for neglecting to take a picture of the actual candy, but for an adult they're pretty much bite sized - for M they were big enough for a multitude of nibbles and face smears. Eh, whatever. They certainly pack a pretty good chocolate wallop, especially with the filling. If the coating were dark chocolate (my general preference) instead of milk, these morsels would probably be too rich to truly enjoy. As they are, we were all usually happy enough to stop at one, maybe two for an after dinner treat. Still, there's something missing: the toffee. It just wasn't all that present, and more of it would be a welcome addition for helping add a little more flavor depth and textural difference. When I happened across a crumble of it here and there, man, was it good - could just use more of it. M, though? Loved them. They were her choice for an after-dinner treat every night we had them - "Can we have the treat I picked at Trader Joe's?" she'd ask in the sweetest way. For a little added parental bonus, these truffles were an awesome eat-your-dinner motivator. 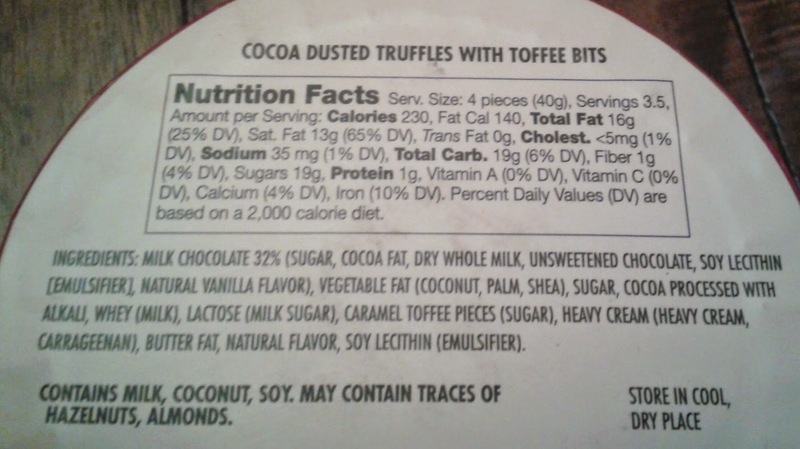 When asked after explaining to her the point scale, she gave these truffles an earnest five. Could be because that's also her favorite number. Eh, I'll take it. When asked what she liked about them, she exclaimed "Because they taste like blueberries! Hahahaha!" Err, well, okay then. Sandy and I enjoyed them too, just need some more toffee. Still, not a bad treat at all. Your little girl has excellent taste. These also make a lovely hostess/dinner party gift. Of course, now I can't find them in my local (14th St in DC) TJs.